My picks as usual will be about 75% goaltending, 20% possession numbers, and 5% “intangibles” (a.k.a. bad goaltending, to paraphrase Gene Ubriaco). The Avs’ luck continues as they avoid the Blackhawks, Sharks, and Kings and end up facing the Cosmonaut in Round One. Bryzgalov was undefeated in regulation as a member of the Wild until a meaningless loss to the Predators on Sunday but behind his 7-1-3 record (2.12, 3 SO) was a mediocre .911 (only .003 better than his Oilers number); Hockey Reference has his Goals Saved Above Average in Minnesota at -0.82. 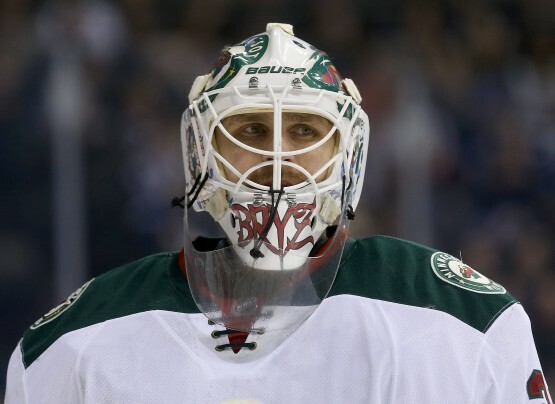 He’s Bryzgalov and he’s bad. Varlamov may or may not be an abusive thug but he’s really good (27.45 GSAA according to Hockey Reference, with a league-leading 15.5 goalie point shares). The Wild might have the best skater between the two teams in Ryan Suter and yes, the Avs’ no-name defense is suspect (though fantasy hockey fans should know who Tyson Barrie is by now), but Colorado is better enough overall in this matchup of below average possession teams that I don’t think it matters. Sometimes the Stanley Cup final occurs in Round One. The Blackhawks were the second-best possession team in the league; the Blues were seventh, and the Blues lack a Kane or Toews or even a Duncan Keith (depending on how much you like Pietrangelo, which would have to be a lot). So picking the Blues comes down to Toews and Kane being less than 100%, and to goaltending, both pro-St. Louis (Ryan Miller really was worth the picks plus prospect plus/less Halak’s contract–though small sample size warning, Miller as a Blue: 10-8-1, .903, -5.16 GSAA) and anti-Chicago (Corey Crawford‘s true talent level is somewhere between last year’s playoffs of .932, 1.84 and the prior year’s playoffs of .893, 2.58). Or maybe, I picked St. Louis to win the Cup before the season, so why change now. The Stars were a top ten possession team this past season and the Ducks weren’t, Kari Lehtonen has always been underrated, and Seguin-Benn-Nichushkin is as close to Getzlaf-Perry-random winger as you would want. I think this is a closer series than it looks (although actually it may look pretty close to some observers), and that the Ducks will miss Dustin Penner, but I’ll take home ice and Getzlaf-Perry-random winger, I guess. Replacing Jonas Hiller (-3.85 GSAA) with Fredrik Andersen (7.47 GSAA) also helps. Will this be the end for the Finnish Flyer? Somehow, Steve Mason didn’t totally collapse down the stretch the way “three-year extension” and “Paul Holmgren” and “Steve Mason, career” suggested he would; after an .899, 2.92 December and an .889, 3.28 January, he went .938, 1.91 in February (well, four games), .917, 2.48 in March, and .935, 1.93 in April (also four games, but still). Unfortunately, he may be out with an upper body injury/whiplash/a concussion/syphilis, and Ray Emery’s “eye-opening career numbers against the Rangers” (7-2, .936, 1.87) are meaningless without Zdeno Chara and Chris Phillips in front of him six years later. Also, even with a healthy Mason, check out Mason’s career year with Columbus (.916, 2.29) and then check out opposing goaltender Henrik Lundqvist’s career (.920, 2.26). And also check out the two teams’ overall possession numbers (the Rangers are 6th, the Flyers are 23rd, a 5.5% difference). Why I think this series will be close anyway: Claude Giroux, Jakub Voracek (the best possession forward on either team by Fenwick close–the best possession player believe it or not is Anton Stralman), Sean Couturier, a better Flyers offense (2.84 vs. 2.61 goals/game), an injured Chris Kreider, a less than 100% Ryan McDonagh. I picked the Rangers to come out of the East before the season the past two years and I won’t change that now either (sorry, Boston), but this won’t be a blowout. Also: did you know Andrew MacDonald led the NHL in blocked shots (242)? Can you name last year’s blocked shots leader? Me neither. I hate to agree with Barry Melrose, although I don’t to the extent that his upset pick of Columbus is based on the fact that “the Penguins and Fleury are playoff chokers.” They aren’t; Fleury is overrated in the regular season (outside the analytics community anyway, where he might be underrated at this point) and Bobrovsky is a vastly better goalie. I do like the Pens’ improved depth (i.e. Stempniak but also Goc), but even so, Columbus was a slightly better possession team than the Penguins this season (50.8% vs. 50.2% 5v5 Fenwick close), so the questions are, can they keep it up and can the top guys stay healthy enough that the goaltending matchup doesn’t matter? I’m betting no. This one seems like a mismatch because the Bruins are embarrassingly dominant and the Red Wings were actually outscored (2.65 goals per game, 2.70 goals against per game) this season. The Bruins have both the likely and deserving Vezina winner and the likely and deserving Selke winner. They were also the best possession team in the East (fourth overall); the Red Wings were 11th. Still, it’s the Red Wings. Even without Zetterberg (I guess), and with a less than 100% Datsyuk and Alfredsson, this team is still deep enough and well-coached enough that they’re difficult to write off completely. Plus, there’s this guy. On the other hand, Jimmy Howard‘s GSAA this season: -5.30. Tuukka Rask’s: 26.40. Detroit won a few Cups with Chris Osgood as their number one, but this is just cruel. Tampa a été le 10e meilleur possession équipe; Montréal était la 22ème. Montréal n’a pas Steve Stamkos. Daniel Brière n’est pas Steve Stamkos. Thomas Vanek est plus proche mais n’est toujours pas Steve Stamkos. D’autre part, Ben Bishop (18.48 GSAA) est blessé et Carey Price (23.51 GSAA) n’est pas. En outre, il n’y a qu’un seul Max Pacioretty. This entry was posted on April 16, 2014 at 1:00 am and is filed under Flyers-related with tags Bryzgalov, Carcillo, Corey Crawford, Daniel Brière, Datsyuk, Fredrik Andersen, Jonas Hiller, Kari Lehtonen, Kings, Lundqvist, Mike Trout, Nyquil, Nyquist, Poulet Frit du Kentucky, Ryan Miller, Sharks, Steve Mason, The Cosmonaut, Tuukka Rask, Varlamov. You can follow any responses to this entry through the RSS 2.0 feed. You can leave a response, or trackback from your own site.